If the nation’s gross national income—over $14 trillion—were divided evenly across the entire U.S. population, every household could call itself middle class. Yet the income-level disparity in this country is now wider than at any point since the Great Depression. In 2010 the average salary for CEOs on the S&P 500 was over $1 million—climbing to over $11 million when all forms of compensation are accounted for—while the current median household income for African Americans is just over $32,000. How can some be so rich, while others are so poor? 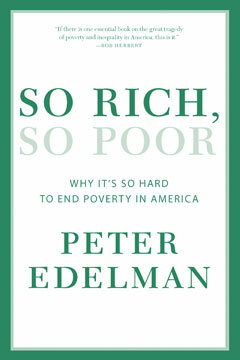 In this provocative book, lifelong antipoverty advocate Peter Edelman offers an informed analysis of how this country can be so wealthy yet have a steadily growing number of unemployed and working poor. According to Edelman, we have taken important positive steps without which 25 to 30 million more people would be poor,but poverty fluctuates with the business cycle. The structure of today’s economy has stultified wage growth for half of America’s workers—with even worse results at the bottom and for people of color—while bestowing billions on those at the top. So Rich, So Poor delves into what is happening to the people behind the statistics and takes a particular look at the continuing crisis of young people of color, whose possibility of a productive life too often is lost on their way to adulthood. This is crucial reading for anyone who wants to understand the most critical American dilemma of the twenty-first century.